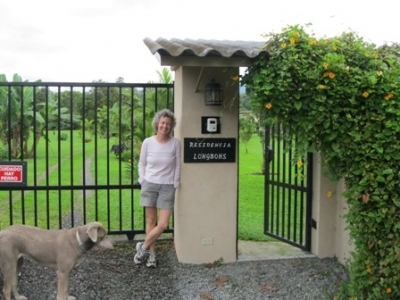 Located in a quiet, rural setting your private accommodations will provide a comfortable base for exploring all the highlands of Panama have to offer. The kitchen is fully equipped with full size appliances, the beds are comfortable with fine linens, and the decks offer quiet areas to unwind. The vistas from floor to ceiling windows in both the upper and lower levels give the feeling of sitting in the trees. Stroll the surrounding lanes that bird watchers from all over the world come to and see exotic birds. One recent guest was amazed to spot 87 species on our property alone (see below for complete list). Expand your search to the nearby hydro-electric dam, within easy walking distance, or to La Amistas and Volcan Baru National Parks, both within easy driving distance. End your day with a peaceful night's sleep enhanced by chirping crickets and flickering fire flies. Bird List: Cattle Egret, Black Vulture, Turkey Vulture, Roadside Hawk, Yellow-headed Caracara, Peregrine Falcon, Spotted Sandpiper, Pale-vented Pigeon, Scaled Pigeon, Ruddy Ground-Dove, White-tipped Dove, Sulphur-winged Parakeet, Barred Parakeet, Orange-chinned Parakeet, Blue-headed Parrot, White-crowned Parrot, Squirrel Cuckoo, White-collared Swift, Vaux's Swift, White-necked Jacobin, Snowy-bellied Hummingbird, Rufous-tailed Hummingbird, Blue-crowned Motmot, Fiery-billed Aracari, Olivaceous Piculet, Red-crowned Woodpecker, Golden-olive Woodpecker, Lineated Woodpecker, Slaty Spinetail, Streak-headed Woodcreeper, Greenish Elaenia, Yellow-bellied Elaenia, Slaty-capped Flycatcher, Paltry Tyrannulet, Common Tody-Flycatcher, Bran-colored Flycatcher, Black Phoebe, Dusky-capped Flycatcher, Panama Flycatcher, Great Kiskadee, Boat-billed Flycatcher, Social Flycatcher, Piratic Flycatcher, Tropical Kingbird, Fork-tailed Flycatcher, White-winged Becard, Masked Tityra,Yellow-winged Vireo, Philadelphia Vireo, Blue-and-white Swallow, Northern Rough-winged Swallow, House Wren, Orange-billed Nightingale-Thrush, Clay-colored Thrush, White-throated Thrush, Tennessee Warbler, Northern Parula, Chestnut-sided Warbler, Blackburnian Warbler, Black-and-white Warbler, Mournig Warbler, Rufous-capped Warbler, Bananaquit, Hepatic Tanager, Summer Tanager, Cherrie's Tanager, Blue-gray Panager, Palm Tanager, Silver-throated Tanager, Bay-headed Tanager, Golden-hooded Tanager, Scarlet-thighed Dacnis, Blue Dacnis, Green Honeycreeper, Shining Honeycreeper, Red-legged Honeycreeper, Variable Seedeater, Yellow-faced Grassquit, Black-striped Sparrow, Streaked Saltator, Buff-throated Saltator, Rose-breasted Grosbeak, Great-tailed Grackle, Crested Oropendola, Yellow-throated Euphonia, Spot-crowned Euphonia, Lesser Goldfinch. Please note that rates are based on double occupancy. There is an additional fee of $15 per person/per night for more than two people. The owner advises that a car is required for this location. When leaving the airport, turn left and drive 3.4 kms. You will see the police station on your right. Turn left (North) on Calle Miguel Brenes and go 1.8 kms. (you will pass a McDonalds on your right). This road T's into the Pan-American Highway. Turn left (West) and go 21.3 kms to the town of Concepcion. Turn right and drive another 21.9 kms to the pueblo of Cuesta de Piedra. Turn right at the Mini-Super Don Nacho market and go 2 kms where you will see a large, green water tank on your left. Our driveway is approx. 200 meters past the tank, on your left. There are cream colored stucco walls lining the drive and the gate is black iron. Should you have any problems finding us, not to worry, just call us at 6499-8085 and we will find you and bring you home. Beautiful, relaxing, great location. Truly home away from home!